Olivier was born of Swiss parents on the 11th November 1956 in Geneva, Switzerland. He attended primary and secondary schools in Geneva where he graduated in 1972. From 1973 until 1978 Olivier obtained diplomas and certificates in jewelry, mechanics and welding. 1978: he started venturing into Africa with his first trip through North Africa and the Sahara desert in a Peugeot 404. It was during this first trip to Africa that Olivier decided to make a career in the safari tour business. It was also during this trip that his fellow travelers advised him to attend a cooking course of some sort, mostly to prevent himself from being murdered on future trips. Olivier attended a gourmet chefs cooking course in Geneva in 1980 and shortly after that started venturing further afield, traveling through South and North America for 6 months and later through Asia and Australia for a year. 1982: he was employed as a freelance tour guide and his travels took him all over Africa. 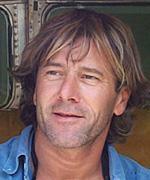 1991: Olivier started working for a Swiss Medical Relief Unit in Bushmanland in Namibia. From 1992 to 1995 Olivier operated his own safari tour business - called Blue Sands Tours - his base was in Bushmanland and his tours, catering mostly for Swiss tourists, took him through Northern Namibia, Zambia, Zimbabwe and Botswana. Of course, two of the attractions of Blue Sands Tours were the outstanding cuisine and the game viewing by microlight. For the last several years Olivier has earned a living from photo journalism, interspersed with safaris and microlight expeditions. His articles on microlight flying through Africa and Europe have brought him fame and recognition, never before achieved in this sport discipline. 1987: Olivier started flying paragliders and soon progressed to hang gliders. The natural progression was then on to microlight aircraft. 1993: Olivier obtained his Microlight Instructors rating and later found enough time to get his Private Pilots Licence. Olivier has over 2 ,000 hours on microlights, 100 hours on paragliders, 300 hours on hang gliders and over 100 hours on light aircraft. Olivier dreamt of flying through Africa for many years, so in 1995, together with Mike Blyth, he realised his dream by flying from Cape Town, South Africa to North Cape, Norway - a distance of 21,000 km (13,000 miles). After the 95' expeditions Olivier's microlight flying achievements included long distance solo flights through Europe, North Africa and Southern Africa. In 1999, Olivier and Mike again set the world record by flying 2 trikes from Buenos Aires, Argentina, up through the Americas, Canada, the North Atlantic and down through Europe and Africa, ending in Cape Town, South Africa. It was an 8 month journey of 44,000 kms (27,000 miles). Olivier is an athletic person by nature and plays tennis, squash and runs whenever he has an opportunity. Olivier is a confirmed bachelor, and has a teenage daughter who lives in Geneva. When he is not on consignment or an expedition, Olivier lives in Geneva.